450 MHz (-3 dB) RGB bandwidth, fully loaded — Offers the performance required to maintain signal integrity with the most demanding high resolution signals. Extremely flat response — Switcher performance is further enhanced by the extremely flat response in the critical portion of the bandwidth curve, between 0 and 130 MHz. ADSP™ – Advanced Digital Sync Processing technology — An exclusive, all-digital process that regenerates the sync signal waveform and restores sync level to 5.0 V p-p, TTL, specifications. This ensures a stable sync signal for improved signal compatibility with any LCD, DLP, plasma, or other digital display device. DSVP™ – Digital Sync Validation Processing — Verifies active sources by polling all inputs for valid sync signals. DSVP then transmits the horizontal and vertical sync information to the user through the serial or IP Link ports. RGBHV switching — All models switch separate horizontal and vertical sync to ensure proper sync polarity, providing a more stable image. All models are also fully compatible with RGBS, RGsB, HDTV, component video, S-video, and composite video signals. Channel to channel isolation — Provides excellent isolation between channels and extremely low electromagnetic emissions, perfect for minimizing signal leakage in high security or government environments. Buffered I/O — Each input and output is individually buffered to provide maximum performance and virtually no crosstalk or signal interference between channels. Triple-Action Switching™ for RGB Delay — Blanks the screen when switching to a new source. The new sync signals precede the RGB signals, so there is no glitch shown during the transition. The time delay between the RGB and sync signals is adjustable up to five seconds through front panel, IP Link, or serial control. Audio input gain and attenuation — Allows users to set the level of gain or attenuation for each audio input channel, eliminating noticeable volume differences when switching between sources. Audio output volume adjustment and muting — Can be set dynamically for each channel through the front panel or serial control, eliminating the need for an audio preamplifier in many system designs. Audio breakaway — Provides the capability to break an audio signal away from its corresponding video signal, allowing the audio and video signals from one source to be switched to different destinations. View I/O mode — Users can easily view which inputs and outputs are actively connected. I/O grouping — Allows the matrix switcher to be virtually divided into smaller sub-switchers, making installation and control easier. I/O grouping allows specific outputs, like those designated for a specific video format, to be grouped together. Rooming — All models can be programmed to group selected outputs into specific “rooms,” each with its own set of unique presets. Each room can support up to 16 outputs. A total of 10 rooms, with 10 presets per room, are available. Global presets — Frequently used I/O configurations may be saved and recalled either from the QS-FPC™ – QuickSwitch Front Panel Controller, IP Link, or serial control. This time-saving feature allows I/O configurations to be set up and stored in memory for future use. Tri-color, backlit buttons — Can be custom labeled for easy identification. The buttons illuminate red, green, or amber, depending on function, for ease of use in low-light environments. QS-FPC™ – QuickSwitch Front Panel Controller — Provides a discrete button for each input and output, allowing for simple, intuitive operation. 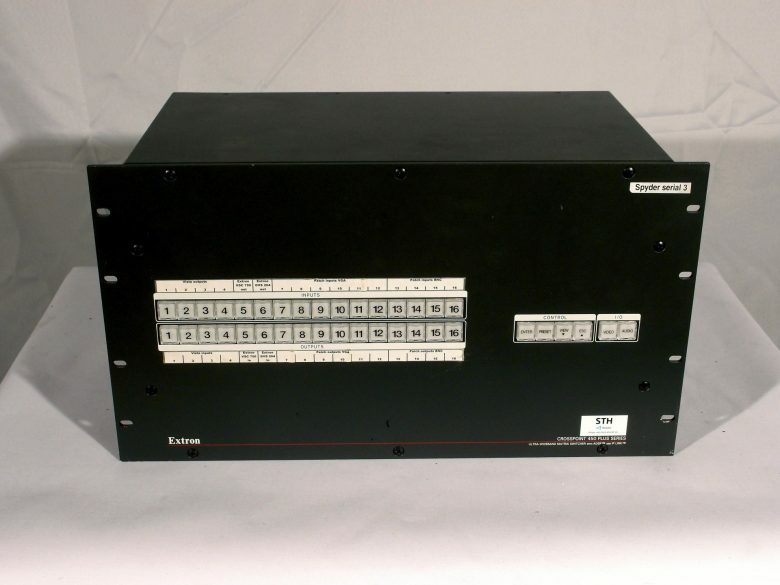 Front panel security lockout — Prevents unauthorized use in non-secure environments. In lockout mode, a special button combination is required to operate the switcher from the front panel controller. IP Link® Ethernet monitoring and control — Engineered to meet the needs of professional AV environments, IP Link enables the CrossPoint 450 Plus matrix switchers to be proactively monitored and managed over a LAN, WAN, or the Internet, using standard TCP/IP protocols. IP Link provides for remote selection of input and output ties, adjustment and control of audio input and output levels, and advanced system diagnostics. IP Link enhanced diagnostics — Provides for monitoring of internal product operating temperature and power supply voltages, e-mail notification of input signal loss, and other critical service information. RS-232 and RS-422 control port — Using serial commands, the CrossPoint 450 Plus Series can be controlled and configured via the included Windows-based control software, or integrated into third-party control systems. Extron products use the SIS™ – Simple Instruction Set command protocol, a set of basic ASCII code commands that allow for quick and easy programming. The RS-232 and RS-422 port also makes it easy to install firmware updates. Control software — Provides a graphical, drag-and-drop interface for I/O configuration and other customization functions via RS-232 and RS-422 remote control. This software also offers an emulation mode for configuration of an offsite matrix switcher; the I/O configuration may be saved for future downloading to the matrix switcher. Optional control panels and keypads — Provide the flexibility to control a CrossPoint 450 Plus Series matrix switcher from a remote location. 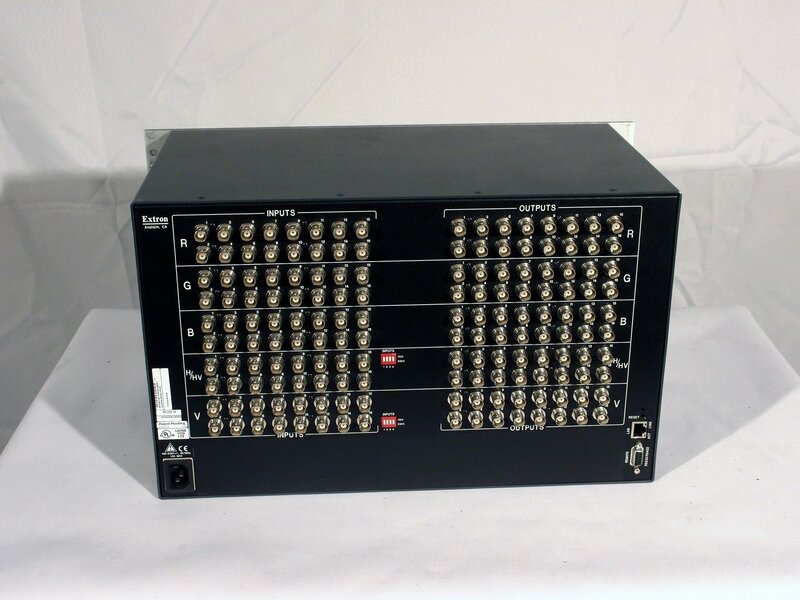 Rack-mountable metal enclosure — All CrossPoint 450 Plus Series matrix switchers are housed in 19-inch wide metal enclosures.